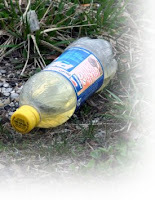 Is Littering a Sign of Serious Character Flaws? The other day while I was out running errands, I saw something I've seen a hundred times before. A passenger in the car ahead of me threw a large plastic bottle out the window. I saw it hit the pavement and roll into the grass next to a sidewalk. I reacted with anger and disgust, which dissipated after a while, because I didn’t know what to do about it. Maybe I should have found a place to park, walked back and picked it up. If that's the right thing to do, I guess I'm not there yet. I had places to go and things to do. "If he would do that, what else would he do?" I think it's a fair question. I don't think I'm over-reacting. I've come to believe that the little things people do reveal a great deal about who they are and what they're capable of. Yes, littering itself is a minor infraction. But anyone who would throw trash into the street is likely to do other disrespectful, insensitive or inconsiderate things. Possibly even cruel things. There have been times when I was shocked by something someone did, and then I thought: "I should have seen that coming." There were early warning signs. Instead, for some reason I ignored them. Was it because I try to be forgiving and tend to give people the benefit of the doubt? Or was I in denial--not wanting to think about some awful possibility? Anyway, litterers give me the creeps. Maybe there are 40 character weaknesses, and this guy was demonstrating his IGNORANCE and NEGLIGENCE. That's exactly right, Sean. The less one exercises a particular strength, a particular weakness is manifest. I believe part of the problem to be a lack of education on respectful behavior. During the 60's and 70's public service broadcasts were made about littering, preventing forest fires, and other things that our society believed to be important. You don't see those anymore. We've created apathetic behavior because we, as a society, have deregulated our values. Media can support messages regarding respectful behaviour and awareness of others, but it cannot replace good personal role models. In my opinion, social responsibility and good behaviour starts in the home. As an example, my children say please and thank you(and they are teenagers!) I also say it, as did my parents. It is part of our "family culture" and that then shows itself in other parts of their lives.